Cam's big backyard is home to lots of wildlife and some insects hang out as well. 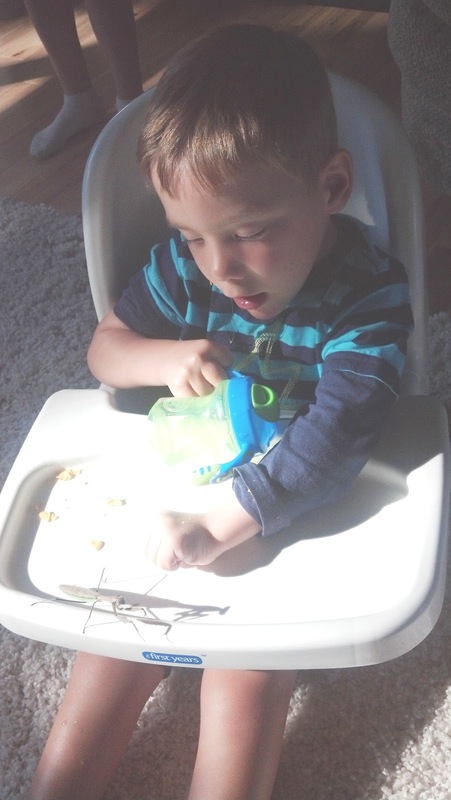 Chris brought a praying mantis inside to show Cameron and it seemed both Cam and the mantis were quite inquisitive. Almost every week now at the Grand Valley University campus in downtown Grand Rapids, Cameron is helping a professor and receiving some awesome physical therapy as well. He is working on balance, reaching, walking, and of course, having a good time while doing it. Although you won't see Cam sporting this hat around town, it does help him practice taking off a hat and putting it on. As a sneak peek at a possible Halloween costume this year, Chris and his boy have some fun with a toy rocket that flies into the air when you press the big red button. A big thanks to Cam's Oma & Opa (Grandma & Grandpa) for providing Chris & Jane with some r&r. We thought it important to mention a milestone we surpassed this week....Cam's blog has had over 10,000 page views in its span of 5 years. We are so thankful to all of you, Cam's avid bloggers, who have kept this weekly entry going. Many of you who read this are people that have touched our lives and Cam's in such a positive way, we are forever grateful. If there's one thing we've learned- it doesn't take a rocket scientist to figure out that Cameron is one of the coolest kids ever! !